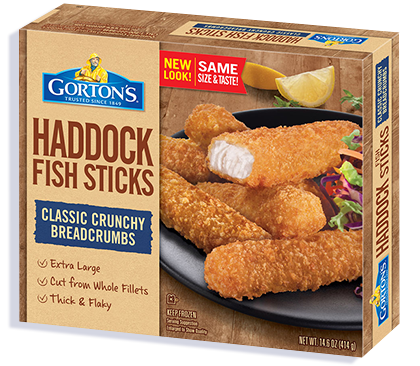 Extra-large, wild-caught Haddock fish sticks. Combining the casual crunchiness of classic fish sticks with the palate-pleasing taste of wild-caught, flaky Haddock, our Premium Haddock Fish Sticks are a match made in seafood heaven. Wheat flour, water, yellow corn flour, sugar, salt, palm oil, onion powder, whey, baking powder (baking soda, sodium aluminum phosphate), yeast, natural flavor. 90mg of EPA and DHA Omega-3 fatty acids per serving.